I’m working on descriptions for the workshops I’ll be teaching in U.S. this spring and hope to have everything sorted and up on the blog by Monday. Time is tight today so I’m just going to leave you with two images of a clutch I stitched up last night, I hope you all have a wonderful weekend! 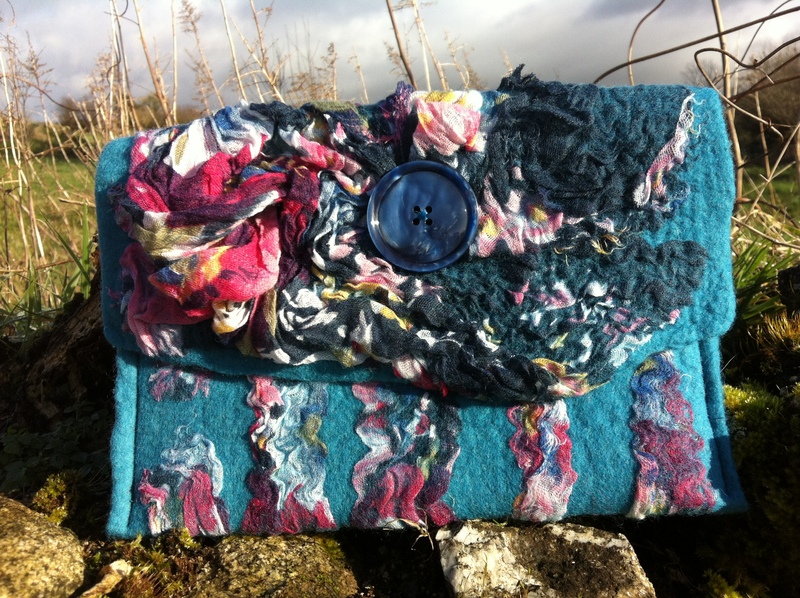 This entry was posted in America 2012, Felt, workshops and tagged Felt, felt clutch, nuno felt, US felting workshops by Nicola. Bookmark the permalink. The felt clutch is simply stunning! Love everything about it. I love the texture and colors!! Love that bag. Texture is fab. Clutch looks ready for spring. Love it!! Looking forward to see what you will be teaching on your USA trip this year. I love they way your felting is always changing…. I really think it is the felting JOURNEY…….that has all of us hooked!! I’m really looking foward to catching up again Carole! At present I’m trying to write up the workshop descriptions but haven’t got very far yet, any suggestions???!!! Beautiful and very artsy! I, too, look forward to seeing you at the Tin Thimble. Looking forward to seeing you too Stephanie!! !